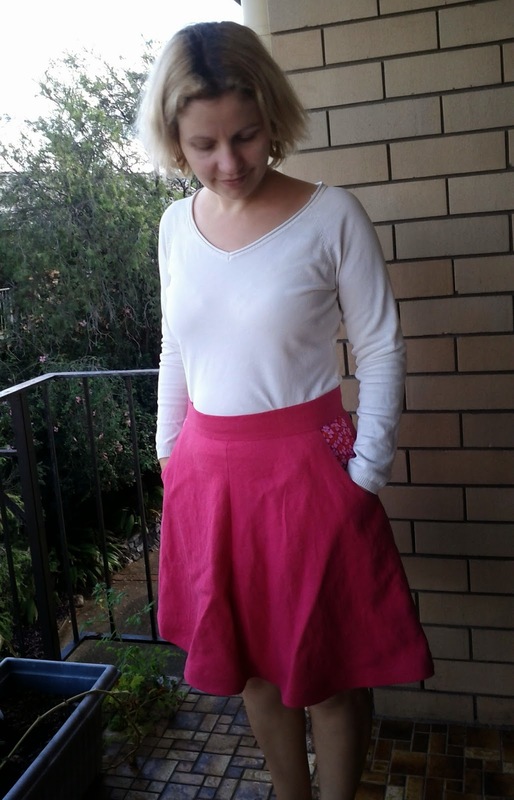 I actually drafted this blog post in February, which is when the skirt was finished to the point that it only needed to be hemmed ... I finally hemmed it a week ago. I loath hemming, it is my least favourite bit of sewing, mostly because I feel like it I mess it up I have ruined all this work. I am being unrealistic there though, because looking at my RTW clothes, they are not hemmed perfectly either and NOBODY notices. Sigh ... my perfectionism ruins it all a bit. 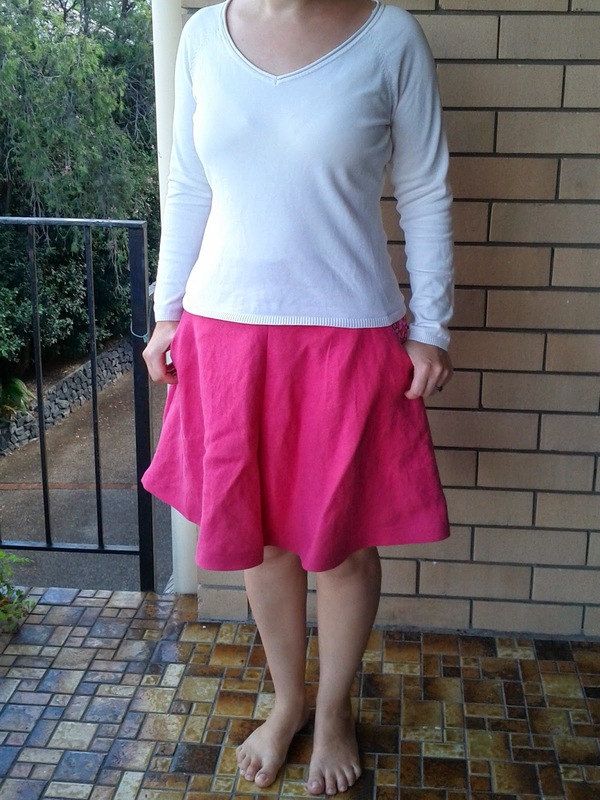 I sewed this skirt mostly in January during my 'down with the UFO's' time whenever I got fed up with my UFOs. It's a heavy linen in raspberry that was part of my remnant haul from the fabric store for Christmas. I hadn't actually realised when I bought it that it was quite as heavy as it was. Originally it was supposed to be a dress for my daughter. I am not very good at judging fabrics and fabric weights and just what it'll look like after washing, but I guess that'll come with time. The fabric was only 70cms long, but about 140cms wide so I managed to squeeze a Hollyburn skirt minus the pockets out of it. The pockets are from a Kaffe Fassett fat quarter - and I had all I intentions of having a close-up picture, but alas the camera problem persists. I think the skirt is very pretty on you, but it's what you think that counts. I should certainly enjoy wearing them now you have them, but if you want your future skirts less full, that would work too. I think it's nice to have a selection of different shapes of skirts to suit whatever mood you are in on the day.